Human Touch Technology Robotic Massage Chair leather/leather match. Quad roller robot, padded arms, power rotatable calf/foot massage, power recline, memory foam in the seat, and partial wood base. Assembly required. Our multi-patent Human Touch Technology® massage system so closely replicates the therapeutic techniques used by back and spinal care professionals that it is the preferred technology of the American College of Chiropractic Orthopedists. It is designed to follow the natural contour of your spine and move three-dimensionally in four different modes. Beneath this luxurious leather are the "hands" of a trained massage professional - ready to provide you with a customized back, leg, and foot massage at the touch of a button. You have to feel it to believe it. Manually move massage rollers to desired location for kneading, compression and percussion. Robot 3 motor - Kneading, Compression, Percussion, Kneading/Percussion, Rolling full, Rolling Zone, 3-level width control, 3-level height control, manual UP/DOWN, Stretch, Auto-restore, Stop/Park. Foot & Calf Massage Vibration (1 speed); Massage (2 speeds + 2 auto programs) Maximum Weight 285 lbs. 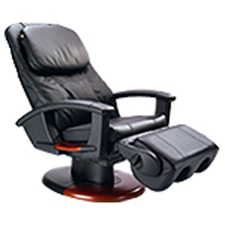 Dimensions of the HT-1650 Shipping box 65" X 40" X 30"
Down Under offers the Human Touch Robotic Massage Chairs. The multi-patent Human Touch Technology® massage system so closely replicates the therapeutic techniques used by back and spinal care professionals that it is the preferred technology of the American College of Chiropractic Orthopedists.